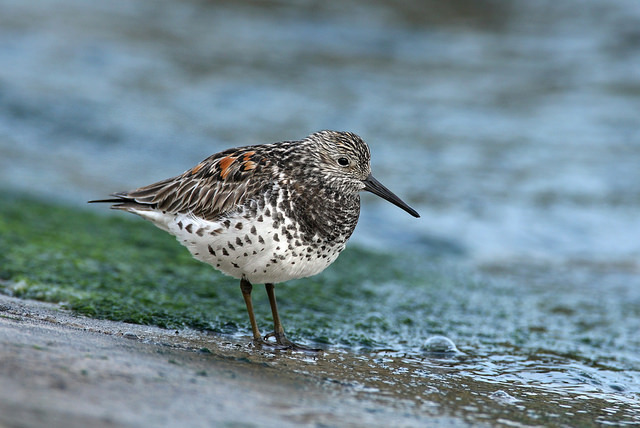 The East Asian-Australasian Flyway Partnership (EAAFP) Secretariat is proposing the “Year of the Knots” to call for attention and urgent conservation actions to save these birds. 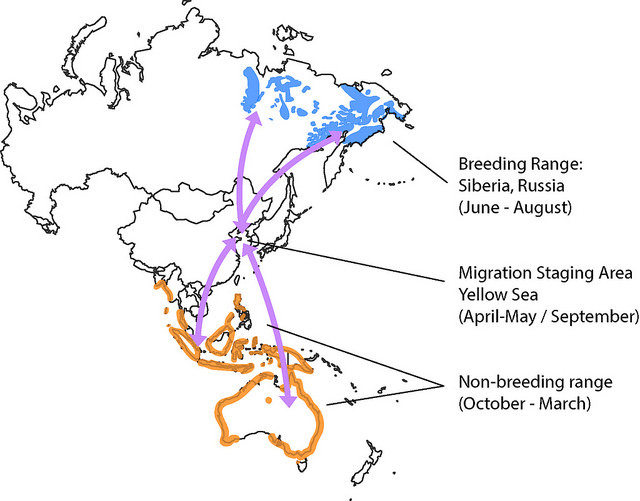 Two subspecies of Red Knot (piersmai and rogersi) migrate along the East Asian-Australasian Flyway (EAAF) and both breed in Russia and spend the non-breeding period in Australia and New Zealand. They are highly dependent on the Chinese part of the Yellow Sea, staging there on both northbound and southbound migrations. The species has been declining at a rate of 2% per year in recent decades. Nothing has changed significantly at the breeding and non-breeding grounds, while large scale changes (reclamation, pollution, and human disturbance) are present and increasing at the main staging area in the Yellow Sea. 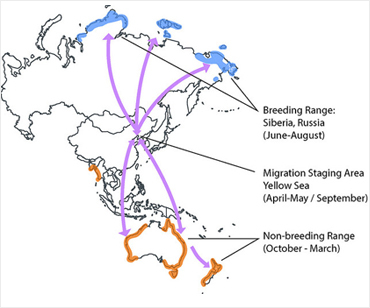 Between their alpine breeding grounds in Eastern Siberia and the main non-breeding grounds on the coasts of Australia, Great Knots Calidris tenuirostris migrate in long, non-stop flights along the EAAF using one or two staging areas on the way for refueling. The population decline is estimated at ca. 2-2.5 % per year in recent decades. Reclamation of tidal areas both in the Republic of Korea and China are considered the main reason for the decline. Almost the entire global population (98%) is restricted to the East Asian-Australasian Flyway. Breeding plumage: mottled greyish upperparts with some rufous feathering. 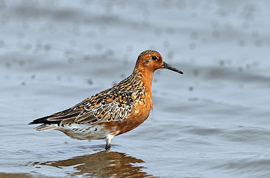 A beautiful artwork of Red Knots will travel along the East Asian-Australasian Flyway, starting the non-breeding site in New Zealand in March 2017, through the Republic of Korea in May, it will arrive at the breeding site in Russia in July, along with the migration of the Red Knots. Read more here. 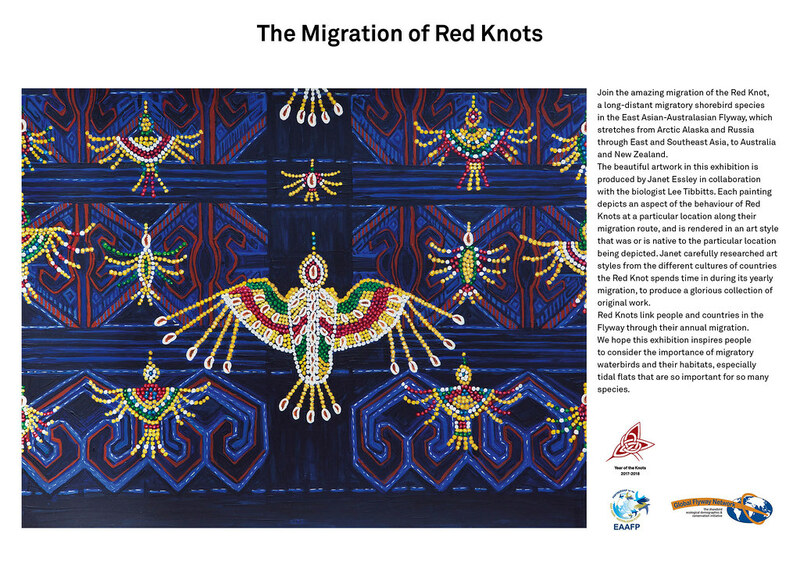 The first Knots Drawing Competition was held in 2017 to raise awareness about the Red Knot and Great Knot. Read more here. Check out the paintings from the countries along East Asian-Australasian Flyway.